Natural hoof care and hoof boot discussions are sometimes as hot and heavy as the conversations around politics and religion. Its interesting to listen to these conversations and hear the different positive and negative arguments. Debate is healthy. Poking a bit of fun at both sides of the conversation. I was contacted by the manufacturer of a new hoof boot last week. They are looking at a possible distribution partnership with EasyCare. We receive these type of contacts because I believe we have built a very solid distribution network with great partners. I received a couple samples of the boot on Monday and did some fitting today. There are some cool concepts in this boot. It's very interesting to see different designs and how problems areas are addressed by other designers. 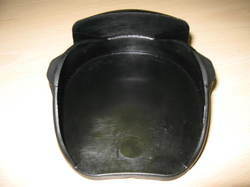 This hoof boot is designed to be worn over iron shoes and not on a bare foot hoof. We are making some progress on all three new EasyCare hoof boots. The next round of samples and test results will determine the exact date each boot will be ready for release. The Easyboot Edge has been testing very well and had an impressive debut at the Death Valley Encounter 200 mile endurance event. Since the DVE test weekend we are making a couple small refinements and one major modification that I believe will be found in all hoof boots in the future. We will keep you posted on the progress here and at the Team Easyboot blog. The Edge is pictured below with the adjustment key. 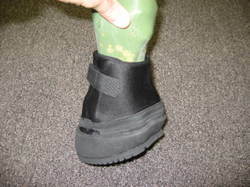 The EasyCare Medical/Therapy boot continues to move forward. We are currently working on selecting a bottom compound that is durable, light weight and and has the correct shock absorbing qualities. This boot will end up being a cost effective treatment boot that will offer immediate comfort for many horses. In addition to the Easyboot Edge and the Medical/Therapy Boot, we have been working on another new riding boot since June 2007. This new boot has some design features of the Dallmer Clog, Renegade Hoof Boot and Easyboot Edge. I'm currently riding in these boots and they are testing very well. Not sure how and when we will name this design but I have a couple ideas. Should be able to show better photos after we submit another round of patent work. The new boot currently has the Easyboot Bare tread pattern for testing purposes. Our molds are set up so the tread plate can be changed independently of the mold upper. EasyCare has been working with Hufshop as our general importer for the German market for over 6 months. They have been a joy to deal with and have done an excellent job making the EasyCare range more available in both the German and European markets. Hufshop has just released a new blog to keep everyone up to date on the latest happenings. Take a look at the blog here and check back for the latest and greatest in hoof care products. Don't forget to check out the collection of hoof boots we have listed on eBay. The highest bid takes all 100 boots! The auction ends on Monday! 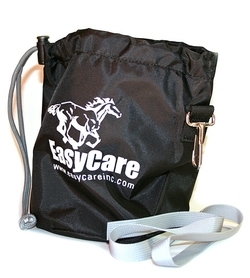 EasyCare has been quite successful in our Hoof Boot Exchange Program. 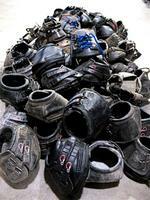 We've decided to sell some of our growing collection of our competitors' hoof boots on eBay. Check it out! 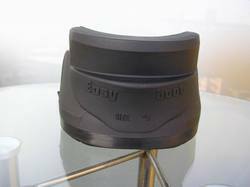 Tags: EasyCare, ebay, hoof boot exchange program, hoof boots, Inc.
New EasyCare Hoofboots are coming soon! 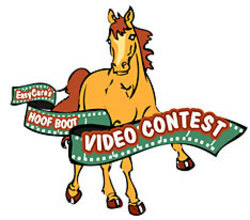 EasyCare had over 1,587 names submitted for our Name the New Hoof Boot Design Contest. Many great names were submitted and we are now working to edit the list and select a name for one of the designs. I personally really like the following names. I'm off to Asia on Friday to visit our factory and put the finishing touches on the new boots. I truly believe both boots are going to be an improvement to our current hoof boot line and each will be released in the near future. Exciting times for EasyCare and barefoot horses. 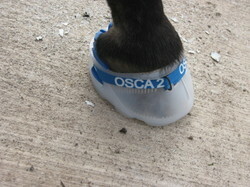 EasyCare is working on some creative marketing strategies to release each of the new hoof boot designs. The introduction of both boots will be different than in the past. 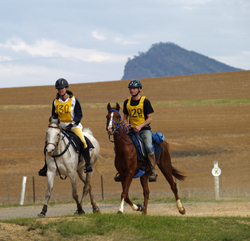 Three of the top ten riders in the AERC National Mileage Championship are competing with EasyCare hoof boots. 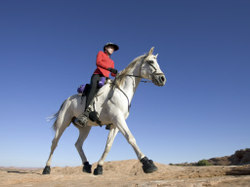 Sarah Martin and her horse Sierra led the list of booted horses with 850 miles. Karen Chaton and Granite Chief are a close second with 830 miles. Dave Rabe and Lightning Strike are in third with 765 miles. Congrats to all three horse and rider teams. Keep up the great work! It's amazing how fast time passes by. We are now more than half way through 2007 and 2008 will be here before we know it. EasyCare hoof boots have accomplished some amazing things in the first 6 months of the year. 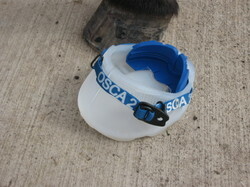 Here is a short list of EasyCare hoof boot accomplishments for 2007. 1. In the first 6 months of the year riders in the $10,000 EasyCare Hoof Boot Contest have ridden 12,770.00 miles. We may end up with 20,000.00 miles by the end of the AERC ride season. 2. We have had several riders complete 5 day 250+ mile multi day events in EasyCare Hoof Boots. 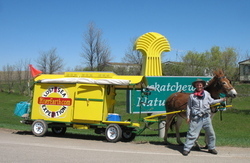 Karen Chaton's blog has some great info about these multi day events. 3. Old Mac's G2s were used in the opening ceremony at the Asian Games. 4. The Australians have been burning up the endurance events in Easyboot Epics and Easyboot Bares. Duncan McLaughlin and Rachel Reid finish first and second at the "The Rock" hundred miler. 5. Bernie and Polly are at it again. Bernie and Polly are now traveling from northern Canada to the southern USA on the Lost Sea Expedition. The team just crossed over the Canadian border into Montana. 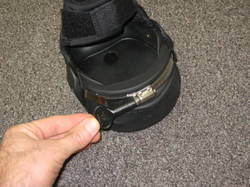 Polly is fitted with custom Easyboots. 6. 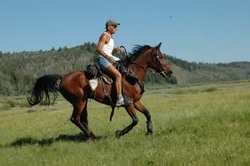 The Horse Journal rated the Easyboot Epic #1 after an independent study on hoof boots. After using the majority of the hoof boots on the market this did not come as a surprise to me. The Epic is a great riding boot, stays in place and performs very well over long and difficult terrain. Looks like another great year is unfolding. 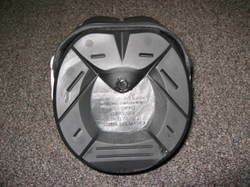 We will have some of our new hoof boot designs being used by EasyCare employees and select test riders very, very soon. We will keep you posted. EasyCare Hoof Boot Education. Is an Easyboot, Easyboot Epic or Old Mac's right for you? EasyCare has just added a great new hoof boot education page to our website. 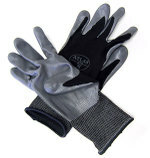 The page is designed to help people select the right horse boot for their horse and riding conditions. The web page helps people select hoof boots based on mileage, ease of application, tread and traction, and boot sole shape. This tool will be very helpful and quickly help people select between Easyboots, Easyboot Epics, Easyboot Bares, Easyboot Grips, Old Mac's, Old Mac's G2, Boa Horse Boots and EasySoakers. We will have new boots to add to the page soon. We have some great news designs in the works! 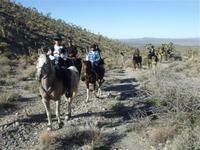 Barrel Racers Gallop in Easyboot Epics! 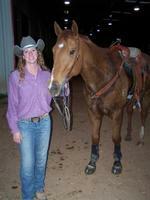 Click here to check out this cool video of Barrel Racer C.J. Holdren and her horse Chuck. Notice... Chuck is sporting his Easyboot Epics! They finished with a race time of 16.514 seconds! Way to go C.J. and Chuck! The new hoof boot design is moving forward quicker than anticipated. I had a great ride Wednesday night in a prototype boot fitted with one of the new design features. I've been trying to isolate each new design feature and will combine the four new concepts as they pass my criteria of tests. Do you have another brand of hoof boots but would like to upgrade? Upgrading your hoof boots has never been easier. All you have to do is send us the boots you are upgrading from and you can purchase new hoof boots from us at a 50% discount. Now that’s a great deal! It’s easy to make the exchange. Just print and fill out this form and send it back to us with the boots you want to upgrade from. For more information and program requirements just click here.